If you ask a Roman to explain the different neighborhoods of the city, you will probably get a lecture about rioni and municipi, which are the administrative divisions of the city. Basically, Rome has 15 different municipi that make up the city: the historic center is contained within Municipio I. Within Municipio I, there are different rioni, neighborhoods. The term rione evolved over time from the Latin regio, and the exact names and boundaries of the different rioni have changed slightly over time as well. 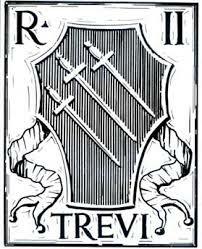 Today, there are 22 different rioni, each with its own coat-of-arms. For example, the 2nd rione of Rome is Trevi, and is, of course, the area around the Trevi Fountain. Now that the mini geography lesson is over… nobody (not even most Romans) really follows the names or exact geographical boundaries of the rioni to a T these days – they simplify things by referring to a neighborhood as the area around a well-known monument or square. For our purposes, the main neighborhoods of the historic center are: Piazza del Popolo/Spanish Steps, Trevi Fountain, Pantheon, Piazza Navona, Campo de’ Fiori, and Piazza Venezia/Jewish Ghetto. The Piazza del Popolo/Spanish Steps are grouped together because they’re so close and the area where any accommodations might be is basically between the two (bordered by Villa Borghese to the northeast and the big shopping street that runs down the middle of the historic center, Via del Corso, to the southwest). This area is upscale with a lot of fancy stores and restaurants, and the Italian families that live around here tend to be on the wealthy side. That means the apartments available for rent are usually (but not always) on the upper end of the price range, but they’re also really beautiful and well-maintained – in other words, worth it! 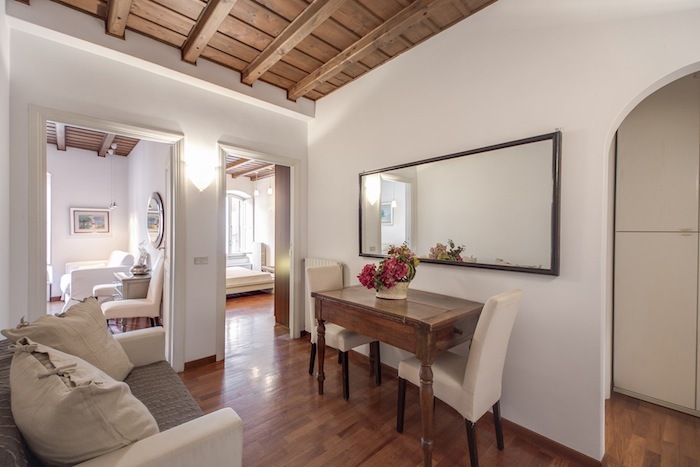 Appartamento Capo le Case – this is a really reasonably priced option in the Spanish Steps neighborhood, especially for the area and quality of the apartment, that sleeps 2-4 people, ranging from €125-145 per night. We don’t have many properties in the Trevi Fountain area, and I couldn’t really tell you why – perhaps it just so happens that most of the apartment owners there prefer to live in the neighborhood instead of turning their apartment into a private rental; perhaps it’s a somewhat less residential area in general (as it’s now full of shops, restaurants, hotels, etc). Either way, on Cross-pollinate we have relatively few apartments in that area, but since it’s a sought-after neighborhood, the ones we do have get snapped up right away. 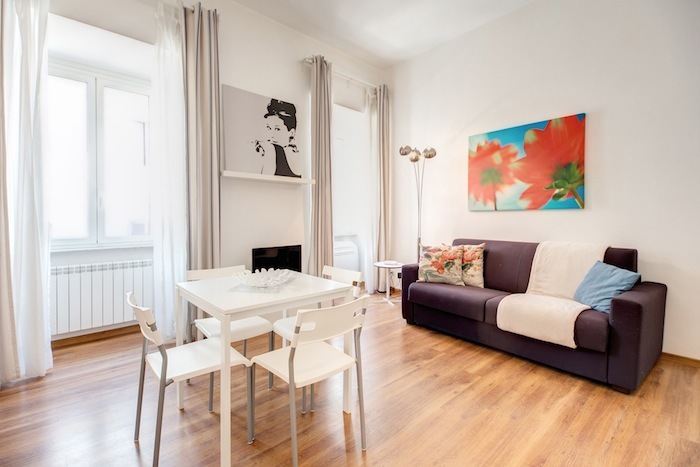 Appartamento Rasella – just a few minutes from the Trevi Fountain, this 2-bedroom, 1-bathroom apartment sleeps up to 4 people and costs €136-159. The next neighborhood, the Pantheon area, is right in between the Trevi Fountain and Piazza Navona. The area comprises the streets directly around the Pantheon and also those directly to the north (most Romans know it as the Campo Marzio area, and the area also includes one of the Italian Parliament buildings, the Chamber of Deputies). The streets around here are mostly small, winding, and cobblestoned – typical of what you’d imagine when you think of Rome. The Pantheon is of course the centerpiece of the neighborhood, but the nearby square with Hadrian’s Temple (now the home of the Italian stock market) is also impressive. 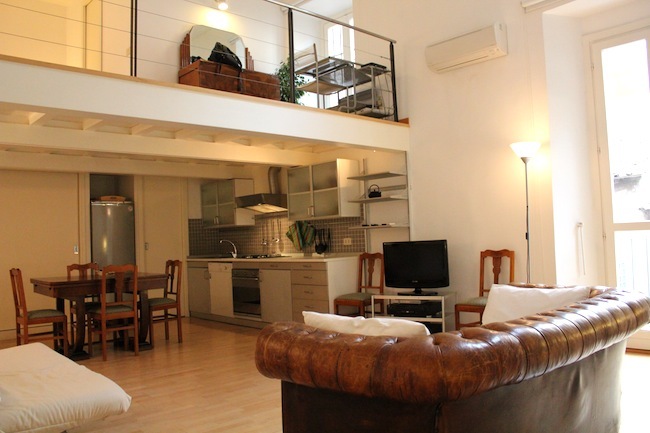 Appartamento Oblò – this is a sweet little find for a couple or a family, ranging from €90-110. It’s small but nicely set up and tucked just behind the Pantheon on a quiet, narrow street. Continuing to the west, there’s the Piazza Navona area. The streets around this area are, much like the Pantheon area, small, winding, cobblestoned, picturesque. Besides the usual collection of restaurants, shops, and hotels, there are also a few streets in this neighborhood that are particularly known for antique shops (Via dei Coronari) and vintage/secondhand clothing shops (Via del Governo Vecchio). These streets are great for wandering around and getting lost. Appartamento Minerva 2 – on one of the most picturesque streets around Piazza Navona, Via dei Banchi Vecchi. A 1-bedroom, 1-bathroom apartment sleeping up to 4 people for €137-159. A short walk from Piazza Navona (crossing the main thoroughfare Corso Vittorio Emanuele II) is Campo de’ Fiori. This square is famous for its fruit/vegetable/flower market during the day, and its nightlife at night. The streets in this area are, again, picturesque, historic, and great for getting lost. 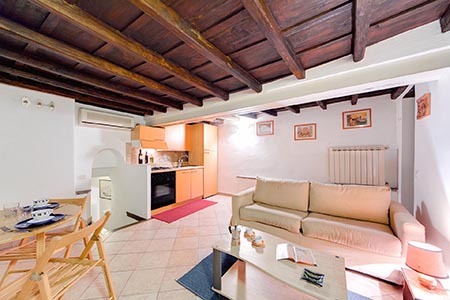 Appartamento Sant’Andrea - about halfway between Campo de’ Fiori and Largo Argentina, and close to the ruins of the Teatro di Pompeo, this is a bigger apartment with a picturesque balcony that can sleep up to 6 people, ranging from €142-165. And finally, the Piazza Venezia/Jewish Ghetto area – grouped into one neighborhood because of their proximity. Accommodations could be just around Piazza Venezia (on the side opposite the Roman Forum), around Largo Argentina (a square with ancient ruins where Caesar was murdered – which, by the way, is now a cat sanctuary), and the Jewish Ghetto, the neighborhood just to the south of Piazza Venezia and bordered by the river on the south. Accommodations very close to Largo Argentina and Piazza Venezia could be on busy, trafficked street, but ones in the Jewish Ghetto – which was, of course, once the ghetto where Jews were forced to live, and is today still the home of a large Jewish community – are on more picturesque, cobblestoned streets. The area is actually very quiet compared to the rest of the historic center and although it gets busy at mealtimes because there are excellent restaurants, there’s no real nightlife (that’s across the river in Trastevere, or over by Campo de’ Fiori) so it’s a great area to stay in. La Casa al Portico – this is right next to the impressive Portico d’Ottavia, an ancient monument in the Jewish Ghetto, and also less than a block from the synagogue. It sleeps up to 4 people for €165 per night. 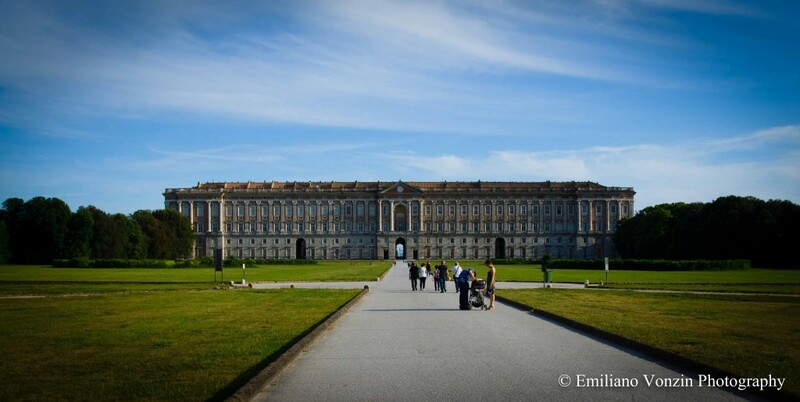 The Reggia di Caserta, or the Royal Palace of Caserta, is not on the tourist radar. 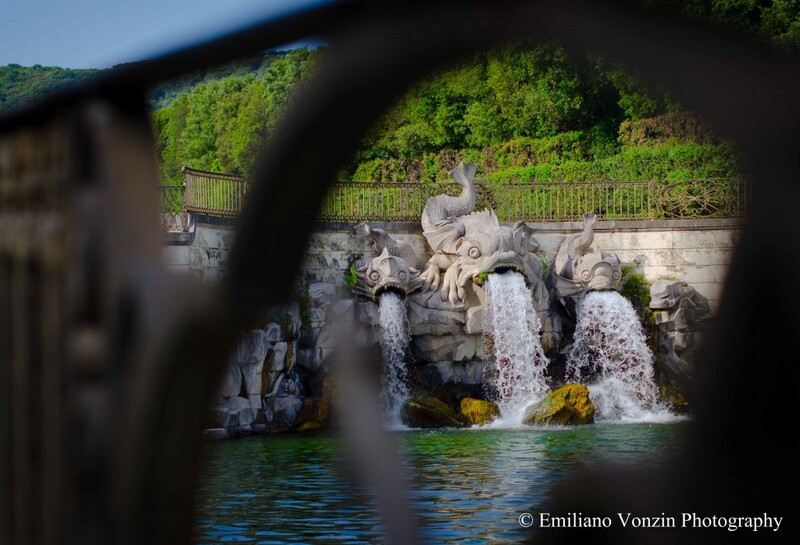 Although it’s a UNESCO World Heritage Site, and close to Naples, for some reason it tends to get passed over by foreign tourists in favor of other, more famous villas (like Villa d’Este in Tivoli, for example). This sumptuous palace, once the home of the Bourbon kings of Naples, is set on enormous grounds that include a waterfall, an English garden, and gorgeous fountains and statues. The Reggia was supposed to be a new administrative center for the kingdom, far from the unrest of Naples and in a strategic, protected location. 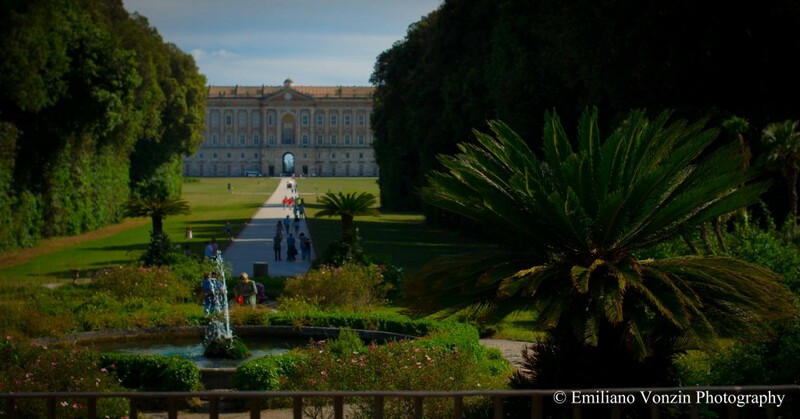 Architect Luigi Vanvitelli worked with King Charles VII of Naples to create the design of the Baroque palace and its gardens, modeled off of Versailles. It could also be called the poor man’s Versailles – not because it was any less stunning than Versailles in its heyday, but because today, unfortunately, it is not very well-maintained. It seems to have perpetual scaffolding on the front façade and the courtyards, which makes for a disappointing arrival. Dust bunnies and debris from the day’s visitors drift around the big empty halls. Pigeons manage to get in and perch (and poo) on some high decorations. Under the front portico – that is, on the inside once you’ve already gone past the ticket booth – you’ll find some locals hawking cheap guidebooks, plastic magnets, and 1970s-quality postcards. Having said that, these are minor issues (though it’s a shame) and the palace and gardens are truly gorgeous and well worth a visit. The best part is – unlike the seething masses of tourists inside the palace of Versailles – it never gets crowded, so even during high season you may find yourself alone to soak up the beauty of a room in santa pace. The palace has about 1200 rooms and is the largest, volume-wise, of all the royal palaces in Europe. The Throne Room is stunning, as well as the Grand Staircase of Honor (which, by the way, masqueraded as the Vatican staircase in Angels & Demons); there are also royal apartments, a library, the Palatine Chapel, and the Court Theatre. Many of the grand halls are decorated with frescoes. The Reggia was even a movie set for a few films – most notably, it was Queen Amidala’s palace in Star Wars: The Phantom Menace. 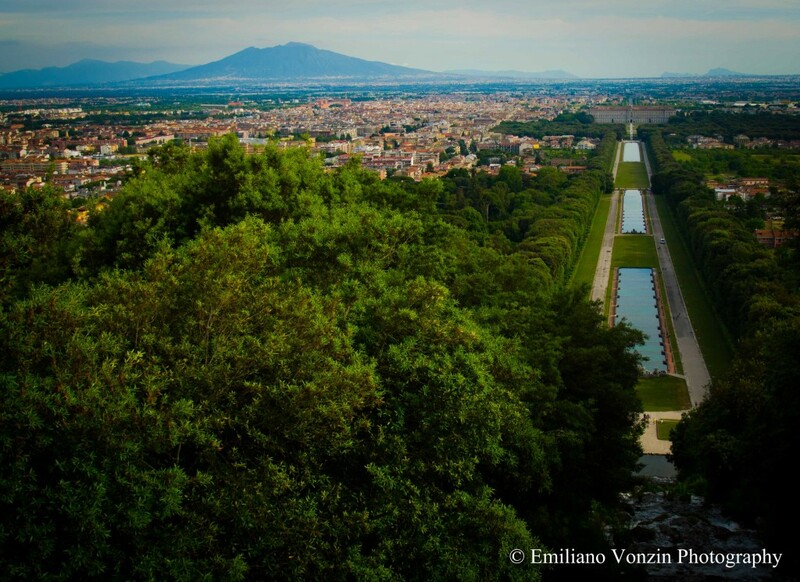 The garden behind the rear palace façade stretches on for 120 hectares, with a series of artificial fountains and small cascades (fed by the Carolino Aqueduct) extending most of the way and ending with a waterfall. Sculptures depicting mythological or religious figures adorn the fountains, like the Fountain of the Three Dolphins, Aeolus’ Fountain, and the Fountain of Diana and Acteon. You can also wander down the shady avenue lined by oak trees, visit the manmade lake filled with fish, and stroll through the English garden. Finish your visit by climbing the set of stairs to the artificial cave called “the Dungeon” on top of the waterfall and get a view of the entire gardens, palace, and beyond. This view, with Mount Vesuvius and the island of Capri in the background, truly looks like a colorful Mediterranean version of Versailles. Full ticket (palace and park) €12. Closed Tuesdays. By train from Rome to Caserta (between 1 hr 15 mins – 2 hrs 20 mins, €11.80-46.10), then a 5-minute walk from the station to the palace. By car on the Autostrada A1 (Milano-Napoli), exit Caserta nord. By train from Naples to Caserta (approx. 45 mins, €3.10), then a 5-minute walk from the station to the palace. By car on the Autostrada A30 (Milano-Napoli), exit Caserta sud. We always thought bee culture was a great metaphor for our travel philosophy. In the beginning, we started with our hotel, The Beehive. When demand outgrew our little ‘hive’, and we started spreading around the business to other small establishments, it was obvious that we would call this service Cross-Pollinate. In the real world of apiculture though, there’s some serious danger, and although Cross-Pollinate has nothing to do with horticulture, we think our relationship with the bees is strong enough to support this cause and want to spread the word about our friends at Your Garden Show. Your Garden Show has joined forces with The Great Sunflower Project to help find out what is happening with our bees, because bees – in the wild, near farms, even in towns and cities – appear to be disappearing. Bees are responsible for one third of all food in the U.S.A. Other important natural products, like medicines, also depend on a thriving local bee community. In monetary terms, bees are worth trillions of dollars. In human terms, they are crucial to our survival. 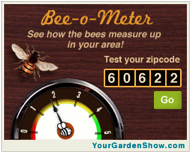 The Bee-o-Meter, a social media program developed to track our bee population, will launch at YourGardenShow.com on April 29, 2011. The Great Sunflower Project, with research sponsor San Francisco State University, has teamed with YourGardenShow.com to build the largest ever simultaneous, multi-point environmental bee pollinator data collection system. For more information and to get involved and help our pollinators, click here.